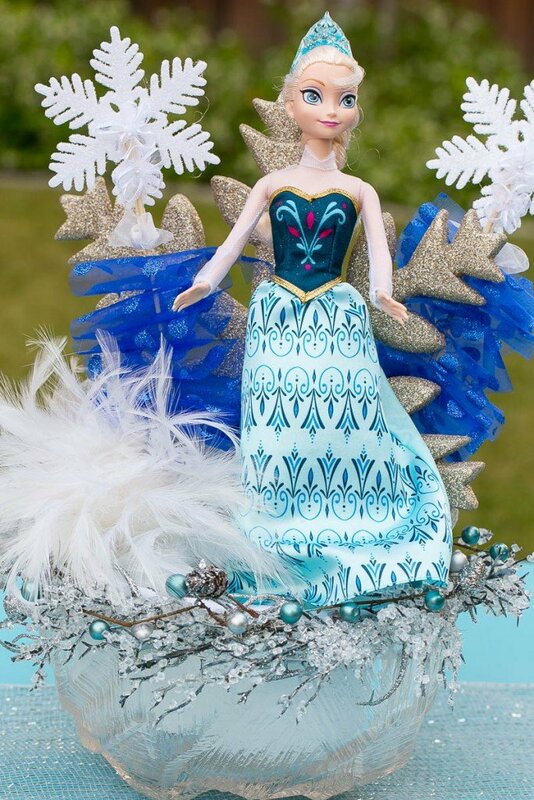 How to plan an amazing frozen themed birthday party without spending a ton of money. Ideas for decorations, food, activities and more! How do you feel about the movie Frozen? Do you love it or do you wish people would just “let it go” already? My daughter Audrey is firmly in the “love” camp. 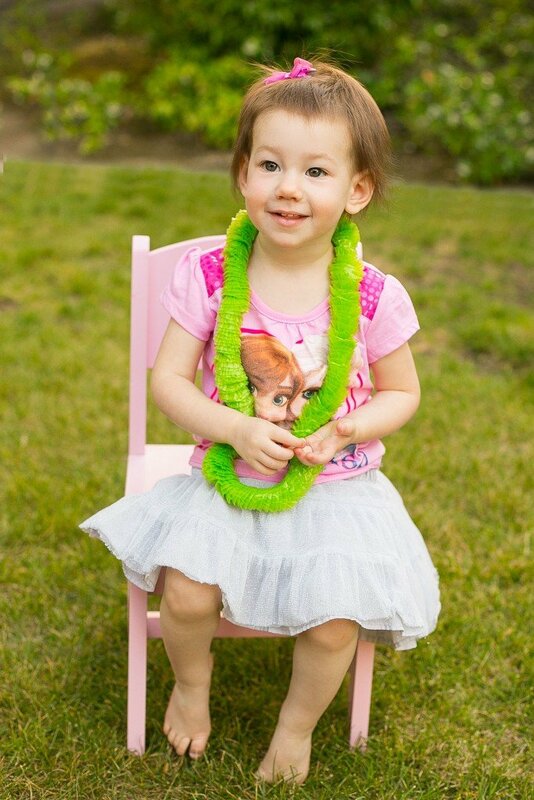 She turned 2 a few weeks ago and we threw her a Frozen themed birthday party that was a big success. We also managed to keep the cost under control which is always a bonus! We went big with the twins’ birthday party back in May but I wanted to do something smaller and more low key this time around. 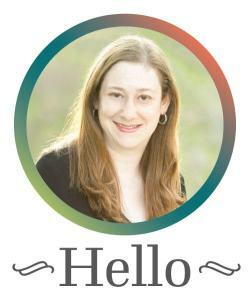 I just invited a handful of friends which meant that we could do really fun invitations. 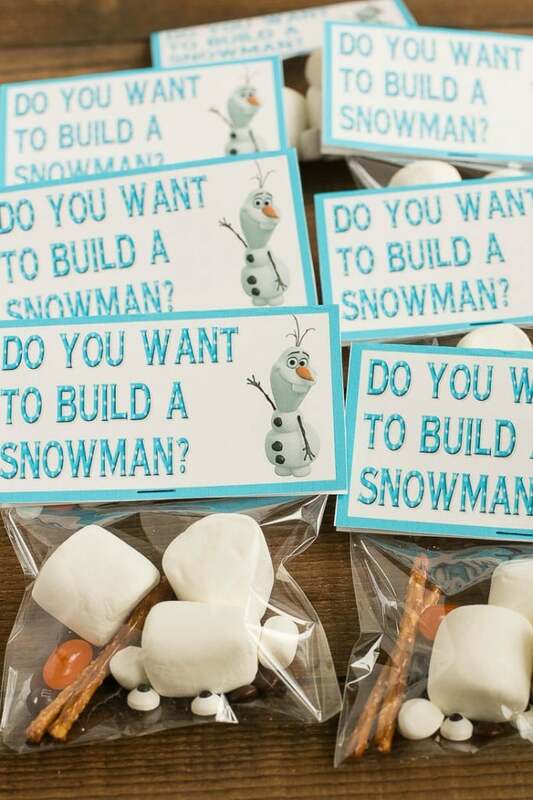 I used this free printable to make edible snowman kits and sent them off to our friends along with an invitation. It was pretty inexpensive to mail them, even the envelopes for families with 2 or 3 kids (I did one kit per kid) were less than a dollar to send out. I can’t take credit for any of the decorations, I am extremely lucky to have a very crafty mom. 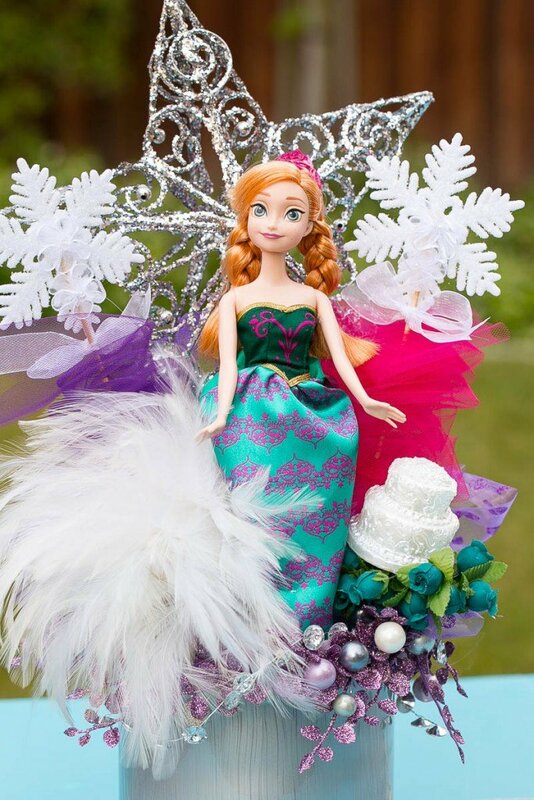 She made these amazing centerpieces from these Anna, Elsa and Olaf dolls that we already had. She found all of the other decorative pieces at garage sales (many were from other Frozen parties!). Everything is stuck into a chunk of styrofoam. 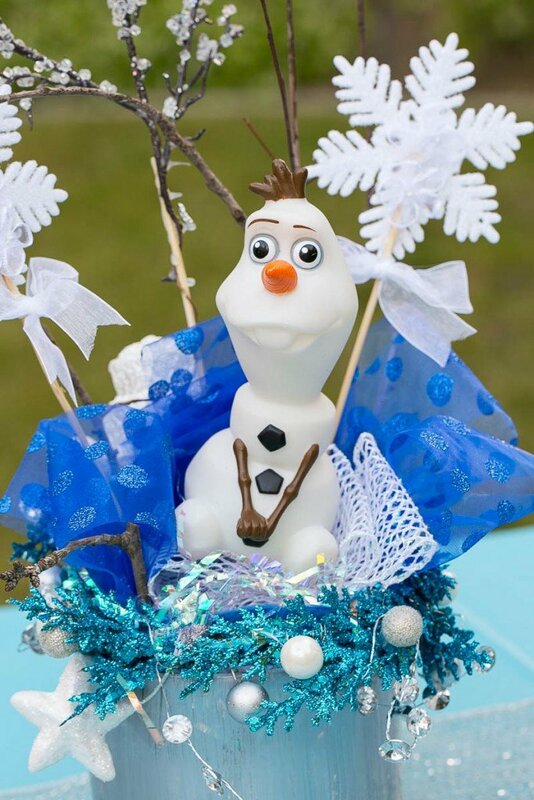 The centerpiece bases for Anna and Olaf are cheap vases that she painted silver to hide the styrofoam and the Elsa centerpiece is on top of a faux crystal bowl. Each table had a different centerpiece which sat on a runner made of this metallic fabric she found on clearance at the craft store. For something a little different, each chair had a pair of dollar store fairy wings strapped to the back. 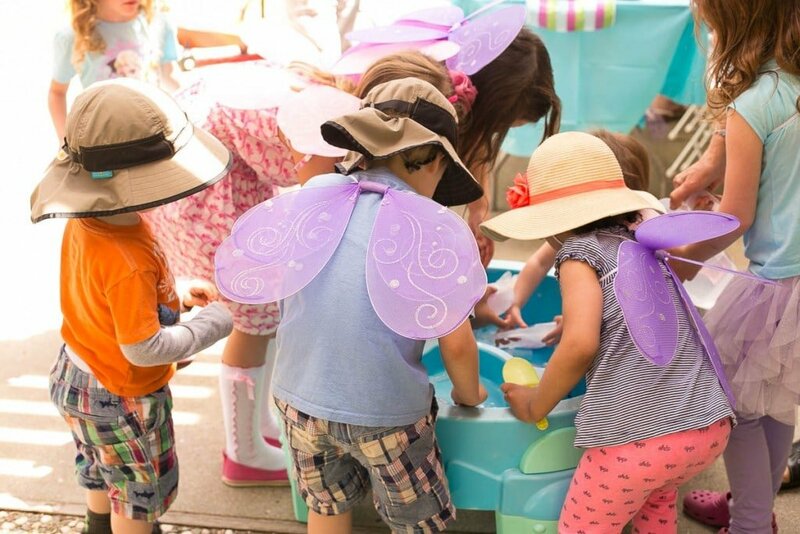 The kids LOVED wearing the wings during the party, even the boys! One thing I did re-use from the big girls’ party was the paper pompoms. The colors were right so why not? 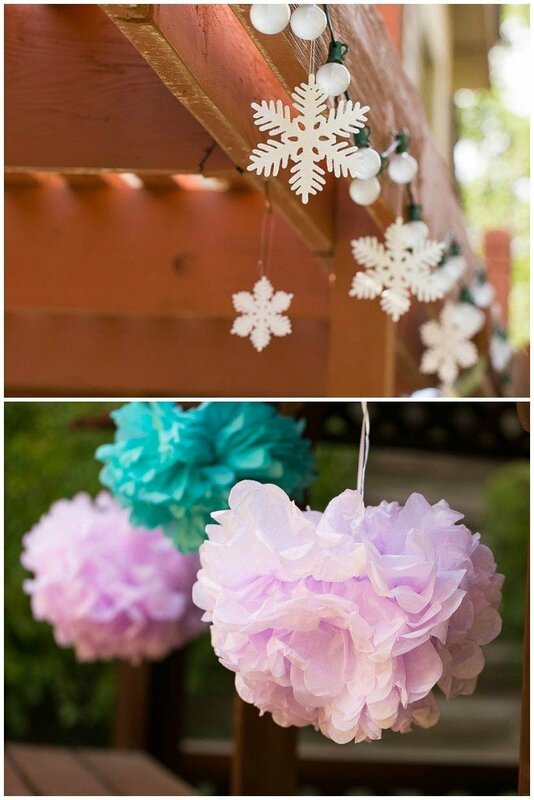 I also hung some sparkly snowflakes all around the patio – our local party store had them on clearance and they looked very festive! This party was just six weeks after the twins’ birthday bash so I really wanted to avoid too much repetition from the first party. To change things up a bit I did a brunch instead of lunch, which worked out great because the menu could be completely different. 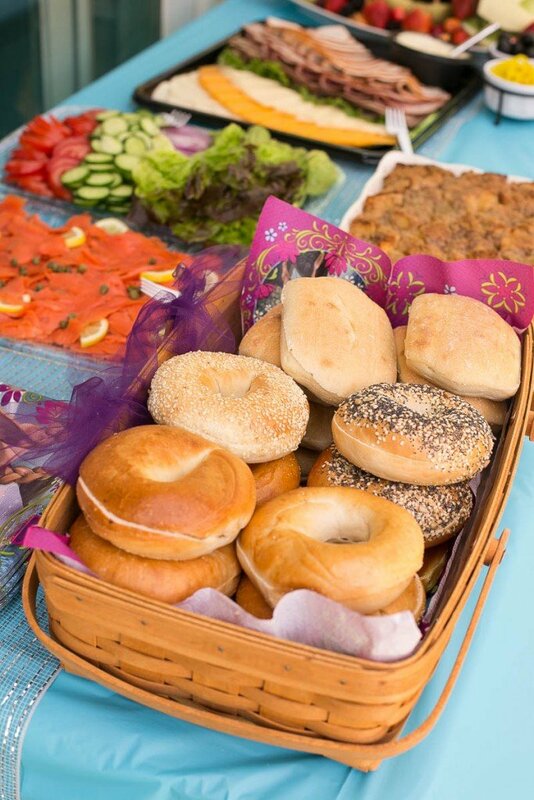 I did a buffet of bagels with smoked salmon, rolls with deli meats and cheeses, a platter with a variety of sandwich and bagel trimmings, baked french toast casserole, rainbow slaw and an Olaf fruit platter (my mom again, she really is the best!). He is cut from two honeydew melons. The first melon makes up the head and the second melon is split in half and filled with fruit to make the body. She held everything together with toothpicks. If you do this, she recommends using an underripe melon for the head, it will hold together the best that way. Of course no birthday party is complete without a cake. This was my first attempt at a tiered cake and it came out pretty cute! The snowflakes are made of candy melts and the figurines came from Amazon. If you’re new to tiered cakes like I am, one thing that really helped me out was a cake leveler, it kept all the layers even so that the cake would be stable and not topple over. 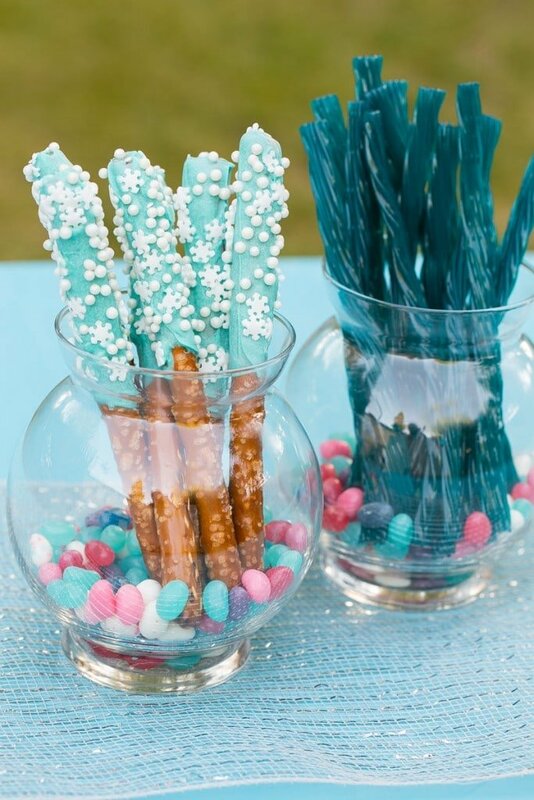 I also dipped some pretzel wands in candy melts and decorated them with snowflake sprinkles and candy pearls. I served the pretzels in a little vase with jelly beans in the bottom. For activities to keep the kids busy, I had our bubble machine going and we had a sand pit again because it was such a big hit at the last party. 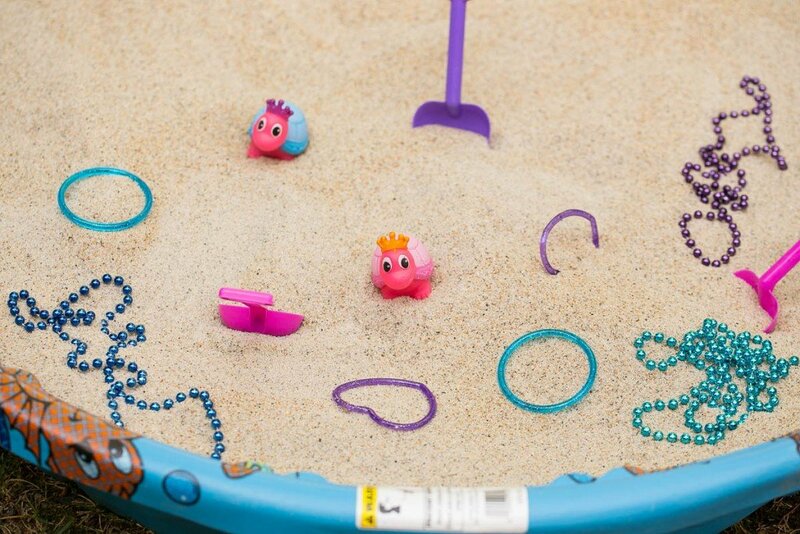 This time we hid necklaces, bracelets and these cute pink princess turtles in the sand, the kids had a good time digging everything up. 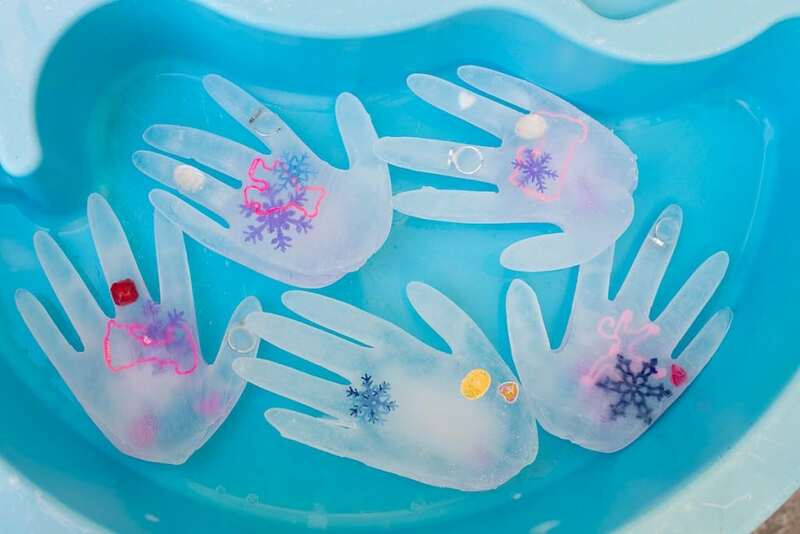 The big hit of the party was our Elsa’s frozen ice hands activity. I poured water into disposable gloves and dropped little trinkets into them (felt snowflakes, plastic Frozen rings, beads, buttons, large rhinestones). I laid the hands out flat and then froze them until solid. After a quick dip in hot water I was able to cut the gloves open and slide the hands right out. I put all of the hands in our water table with a few inches of water. 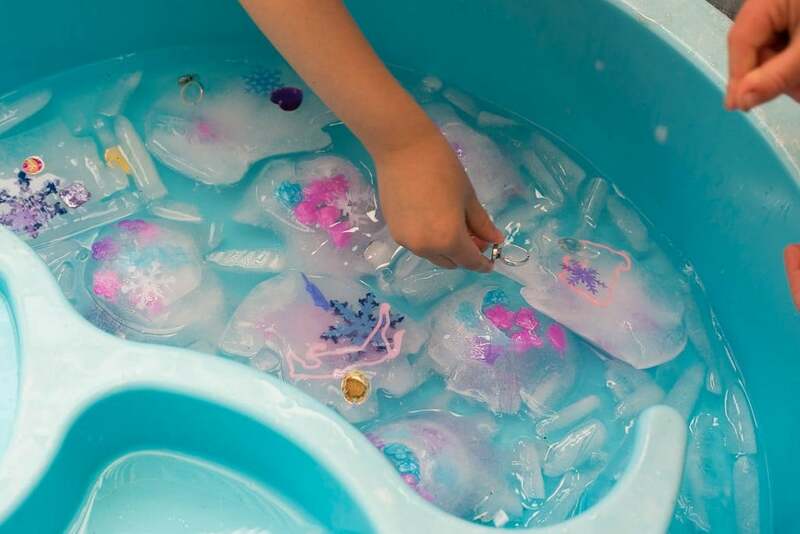 This was a fun way for the kids to cool off on a hot day and it forced them to get creative to free their treasures! Some kids tried to smash the hands to get their loot, others put them on the hot pavement in the sun to melt and the younger kids just had fun doing some splashing and stirring. I let all of our friends know in advance that there would be an ice/water activity so that they could bring extra clothes in case anyone got really wet (no one did). 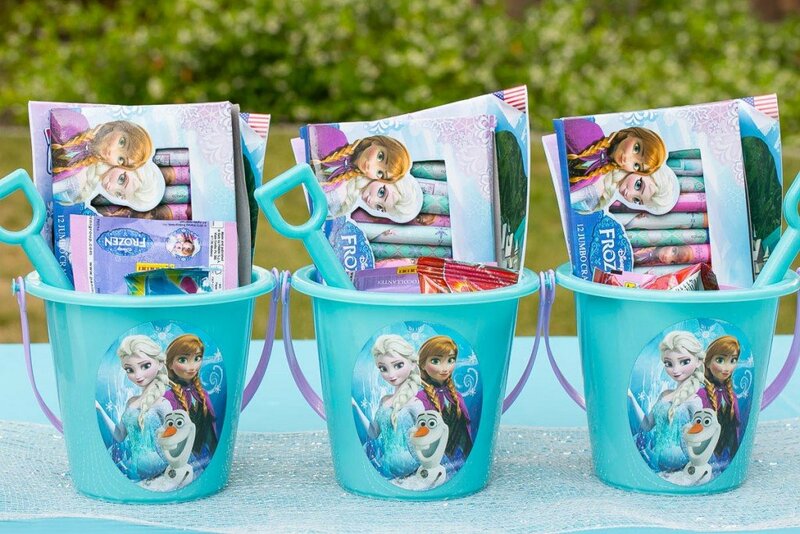 When it was time to go, I sent everyone on their way with these treat buckets full of fun Frozen items like paint with water books, crayons, stickers and a few pieces of candy. Everything came from the dollar store. So what did Audrey think of her party? She absolutely loved it! I thought she was going to take a great nap afterwards and not only did she not nap, I couldn’t get her to go to bed until after 10 pm! Too much sugar, too much excitement! Regardless, I am so thankful for my littlest buddy, she is such a joy and a blessing. Want to see more? 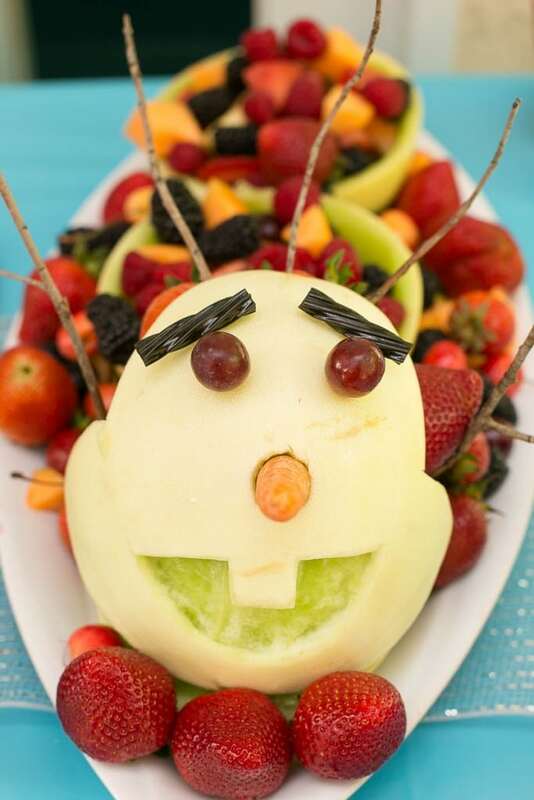 Follow Dinner at the Zoo on Facebook, Twitter, Instagram and Pinterest for more great recipe and party ideas! 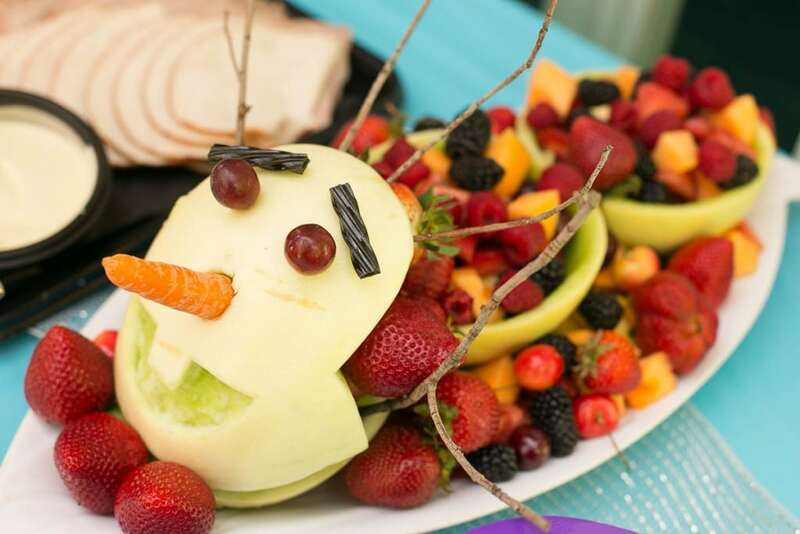 I love the olaf fruit platter. What a fun party! What a FABULOUS execution of the theme! What a wonderful party!! I loved everything especially the frozen hands. I bet everyone had an amazing time. Wow! What a beautiful party. I love how you thought out every detail. My kids’ birthdays are six weeks apart too. It really keeps you busy. What a cute party. Your definitely thought outside of the box, what great recipes and activities! 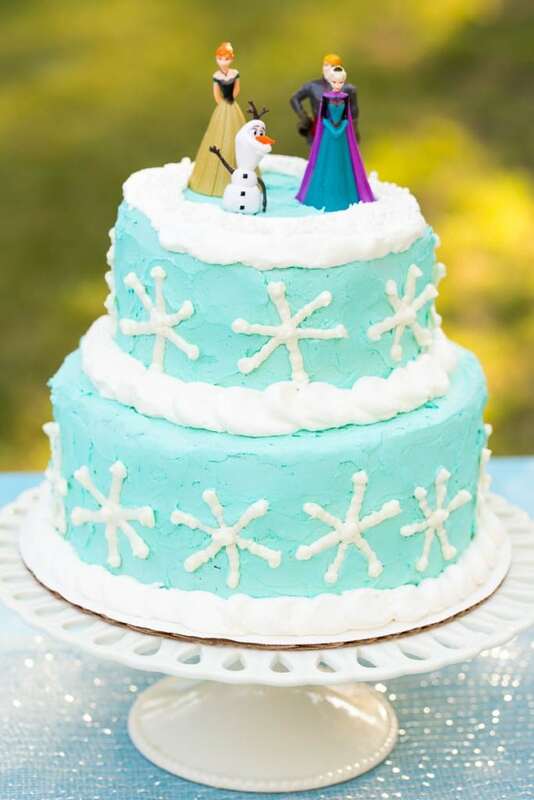 This looks like such a great party – such a great way to have a Frozen party and Olaf is adorable! What an amazing party! My oldest would absolutely flip out for a party like this! 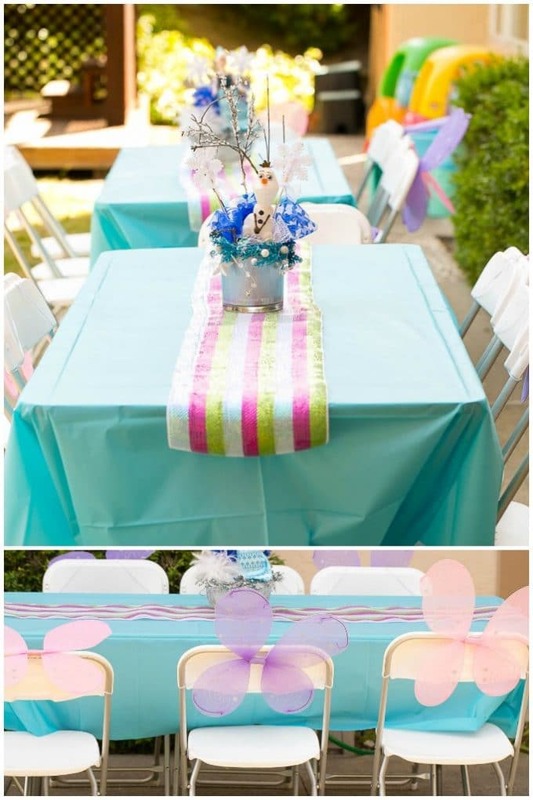 I bet I know a few kids that would love this theme for their birthday party. Frozen is very popular around my house. What a beautiful party! Everything turned out perfect. Very creative. Me-oh-my! You thought of EVERYTHING and then some. SOOO many creative and adorable ideas. And it’s not over the top at all. I love the centerpieces (I bet those would have been fun to make)! Both of my girls have winter birthdays, I’m a summer birthday and I always struggle to figure out how to throw a good kid party in the winter! I wish I could do outdoor birthday brunches like this! Winter birthdays are tricky, although my older girls’ birthday is the end of April and we almost got rained out last year so now I always have it in May to be safe!